You gotta love free stuff right? The free mint that comes with your check after dinner, the free food samples from the food court as you walk through the mall, or the 7th cup of coffee after you’ve purchased six. It’s great when you receive something for free especially when it’s given to you with no strings attached. However, are credit card terminals really given away for free? Before accepting a free terminal offer, look at the fine print of the offer and know what you’re getting. Do you know how to compare the pricing structure, i.e. the rates of other providers that may not be offering you a free terminal offer? It’s not worth taking a free terminal from a provider that is not going to service your account properly or charge you a higher effective rate. Most of the time, free credit card terminals come at a cost of higher rates that go with the processing contract that is required, even if the contract is month to month. To be clear, I’m not against free credit card terminal programs, in fact I have offered a handful of them (and still do) to my clients from time to time. As always, I offer these question to help you understand what you are getting into and from there you can make your own judgment as to whether it’s a good move for your business or not. Rather than listing a handful of specific scenarios that illustrate how higher rates will offset the benefits of a “free” terminal or piece of equipment, let’s look at the cost of the entire merchant account. It’s no secret that merchant account providers charge a provider markup and because of this, profit is generated each month. So with that, what’s the most important consideration for you? It should be to consider the effective cost of the service. For example, if one provider offers a free terminal and a rate of 2.75% while the other provider offers a terminal at a cost of $179.00 but gives you a rate of 2.25% which one is better for you? In the long run the cost of the 2nd option is more financially beneficial even if your volume is a modest $5,000 per month. $5,000 x 0.50% is $25.00 and twenty five extra dollars per month will pay for your terminal inside of 8 months. However, be sure to take into consideration ancillary benefits that you are receiving from both offers because rate is never the end game. It’s important but it’s not the only consideration. Perhaps you’re receiving free gift cards or a better bundled rate because of your affiliation with a marketing program that your merchant account provider recommended. If I asked you to give me a $5 bill, would you do it? In other words, what are you going to get in exchange for the five dollars? Let’s just make it simple and say that in return, I am going to give you a ten dollar bill. That’s a no brainer, right? Now assume that the guy right next to me offers you $12 for that same five dollar bill offer? Which one would you take now? This example is aimed at illustrating the simplicity of comparing one offer to the next if you keep the right perspective. In a scenario where the subject is something definitive like the value of money, we can easily deduct which option is better. 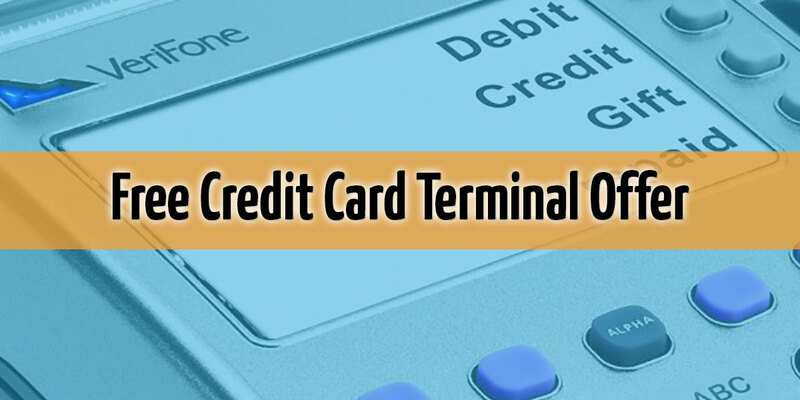 When comparing it to a free credit card terminal offer, these same comparisons can be drawn if you know what you’re looking for and at very least you know the details of the contract and offer that accompanies the free terminal offer. Ask simple questions so that you know what you’re signing up for. Nothing is really free, rather the cost of the item being offered as free is just being transferred to something else. In the end don’t buy a free terminal program just because they have dangled the theoretical carrot in front of your head with a free terminal offer. Look at the whole picture and decide the total cost that is involved with the free offer whether it be a free terminal or a service contract without paying a batch fee.